The client-designer partnership in this kitchen, bath and laundry room remodel was practically a fairy-tale story. While talking with both ACo‘s designer, Carlie Crousore-Suski and her client about the beginning inspiration, process and end result – their answers were nearly the same. Lighter, brighter, “everything” is what they both love in the new design. It started when ACo renovated the Masthead project in Fishers and opened the kitchen reveal to neighbors, friends and clients. The prospective client instantly fell in love with the design and designer, Carlie. Years later, Carlie received a call. As you may notice from before images, the kitchen, powder bath and laundry were dark, divided and displayed poor lighting elements. “By shifting tall items to one side of the room, this allowed us to knock down the wall between the kitchen and dining room to create an open concept with glass doors, glass shelves, open wine storage and great lighting,” Carlie says. “One of my fears of the new design was losing storage, but I actually have more functional storage now,” the client said. The kitchen and powder bath were designed with fully custom cabinetry from ACo. “To state it simply, if you can dream it, we can build it,” Carlie says. Equipped in her client’s kitchen are spice racks, flatware dividers, tray dividers, roll out trays and the cutest and most functional wine storage niche – accessible from both the kitchen and dining room. Just off the kitchen, a powder bath renovation used the same cabinet line. 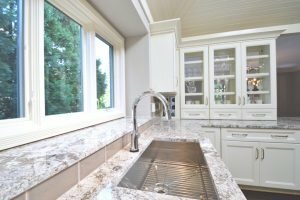 If this flawless renovation story and beautiful design gives you the redo fever, contact a design professional at ACo by visiting their website liveaco.com or give them a call at 317-575-9540.